I’ve just been writing my reviews of HD DVDs and Blu-ray discs for Sound and Image magazine. I did a long one on the newly released The Bourne Ultimatum, which is on HD DVD, so I didn’t have much space for the other HD DVD. 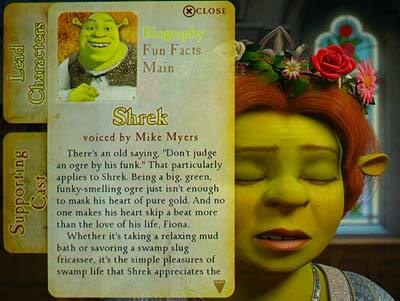 I figured Shrek the Third would fit the bill, since there didn’t seem to be all that many special extras. One of the more interesting are the Web-enabled features. All real HD DVD players come with an Ethernet port so that you can plug the player into your home computer network and access the Internet. The Bourne Ultimatum has quite a few such features, including the ability to download a number of trailers for other movies. These are presented in decent quality VC1 format, at what looks like 720 by 480 resolution. 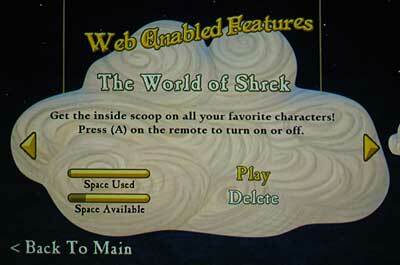 Shrek 3‘s Web-enabled features are fewer, and far more compact. Apparently ‘Donkey’s Digital Coloring Book’ is forthcoming, but in the meantime you can download a trivia track (with 300 items) and ‘bios’ on the movie characters. What do they look like? That’s the purpose of this post. First we have the selection screen for the ‘biographies’. Unlike Ultimatum, you don’t have to log into the Web with a password and user ID to get at this. The following screen would have shown ‘Download’ rather than ‘Play’ and ‘Delete’ if I had take the photo before I downloaded the data. The ‘Delete’ option is necessary because all such features involve downloading data into the ‘Persistent Storage’ of your HD DVD player. This, for current models, is 128MB, so it may be necessary to delete some of its contents to make room for new material. These screens kindly show you how much space will be used for the feature. And here is one example of the bios in action. Note, you can navigate this panel, choosing different items about each of the characters and, of course, choose the characters themselves, while the movie continues to play in the background. 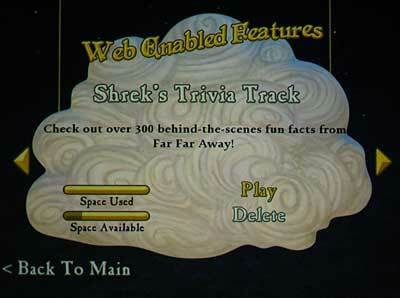 Here is the selection screen for the trivia track. And here is an example of one of the 300-odd track items. I suppose the question is: why wasn’t this stuff just put on the disc in the first place? Room shouldn’t have been a problem, since they only use a tiny proportion of the player’s 128MB of persistent storage, so squeezing them onto a 30GB dual layer HD DVD should have been easy. Could it be that they just weren’t ready at the time the disc was released (such as the Donkey game)? Or perhaps they were left off intentionally to encourage use of the Web-enabled feature. 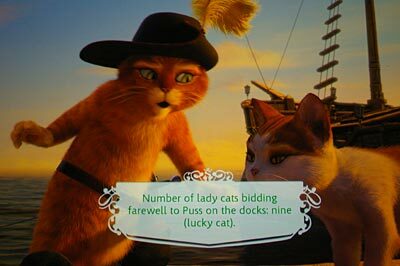 At the moment, this is clearly an advantage of HD DVD over Blu-ray. Even the ‘Final Standard Profile‘ for Blu-ray (most players released until now only comply with the ‘Grace Period’ profile, which lacks even persistent storage) does not require Internet capability. For this, the BD-Live (or Profile 2) standard is required. If and when we will see such a thing seems to be unknown. Nor can I find if this standard will become mandatory, or simply be a ‘Rolls Royce’ version for high end players. If the latter, it’s difficult to see many Blu-ray disc producers including Internet content since this essentially demands a mass base to make worthwhile. HD DVD, however, already has this and has had it from the start! This entry was posted in BD-Live, Blu-ray, HD DVD. Bookmark the permalink.